So I find myself, once again, in the middle of a “whodunnit.” Who really invented the flakey, delicate, butter-ladened layers of dough we’ve come to know and love as puff pastry? The French will say it was invented by a French apprentice bakery cook named Claudius Gele in 1645, who brought the recipe to Florence where it became wildly popular. Ah, but the Italians cry foul and say that puff pastry was already being made in Italy long before that – as early as 1525 – and they say there is a document to prove it! For this beautiful apple tart, made with puff pastry and caramel sauce, I’m staying out of the argument and focusing on thawing the dough, slicing the apples and baking (at least I know where apples come from – thank you, Johnny Appleseed! Maybe…)! This apple tart is simple and elegant, a sweet that is perfect with coffee in the morning or as a satisfying dessert any time of the day. The only important do-ahead is to take the puff pastry out of the freezer and let it thaw in the refrigerator overnight. I think that once you make an apple tart like this, it will become one of your treasured treats. I say let the French and Italians duke it out over this one, and we’ll make apple tarts and not war! Preheat oven to 400ºF. Peel, core, and cut the apples into ¼" slices. Place in a bowl, squeeze lemon juice and salt over apples, and gently toss. Set aside. Carefully unfold both sheets of thawed puff pastry. Place dough on two baking sheets lined with parchment paper. Cut each sheet into 4 equal squares. Fold dough over about ⅛ of an inch around each square to form a thin border. 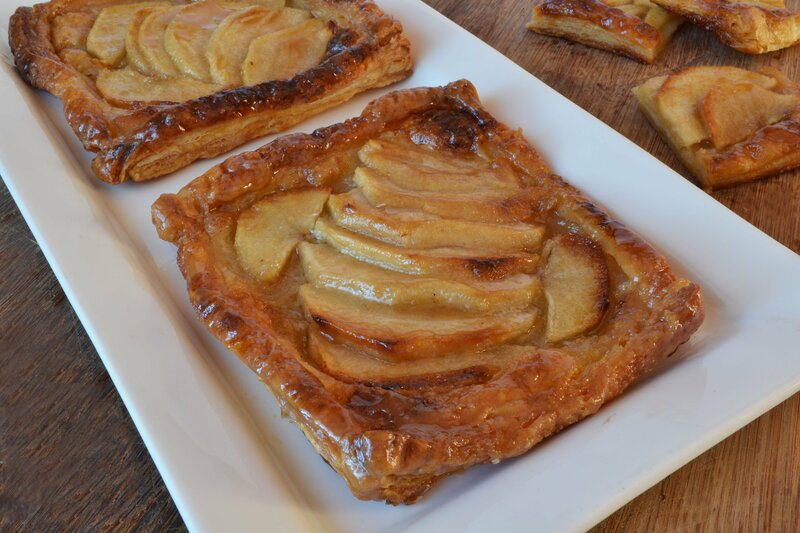 Place slices of apple (overlapping) diagonally across the pastry. Add 2-3 slices on either side of the diagonal slices. Repeat until dough and apples are used up. Sprinkle each square with sugar. Dot each square with 1 tbsp of chilled butter. Bake for 30 minutes, or until pastry is golden-brown. Remove from oven and, while still warm, brush caramel sauce over apples. Can be frozen after cooking. In medium saucepan over medium high heat, bring sugar, cream, butter, and salt to boil, whisking constantly until sugar dissolves. Boil until caramel begins to coat spoon, whisking often, about 7-8 minutes. Brush caramel sauce over Apple Tarts while still warm.